Poaceae is the most economically important vascular plant family, containing many dominant species in various biomes. Since C4 photosynthetic pathway was discovered in 1966 in sugarcane, Poaceae has been focused to study ecophysiological, geographic and evolutionary differences between C3 and C4 species. Although there are large area grasslands in the temperate area, species diversity of Poaceae is much higher in the subtropical area (548 vs 265 species), with a very high C4 species proportion (53% vs 21%), while the proportion of annual species is similar (21% vs 18%). Life history and photosynthetic type both affect the economics of leaf physiological function: on one hand, C4 photosynthesis, facilitated in grasses by specific changes in leaf anatomy, improves photosynthetic efficiency and water-use efficiency, especially in hot climates; on the other hand, according to the leaf economic spectrum, annual plants have lower tissue densities and resource-use efficiencies than perennials. However, whether C4 photosynthesis affects contrasts in functional traits between annual and perennial species is still unclear. 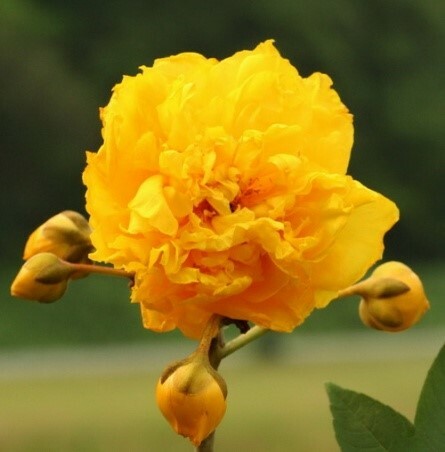 Researchers from South China Botanical Garden, Chinese Academy of Sciences measured 26 traits and niche descriptors for 42 grasses from subtropical China. Differences in the majority of traits were explained by life history (Fig.). (1)The ranges of annual species extended to regions with greater temperature seasonality and lower precipitation, and annuals had less-negative turgor-loss points, higher specific leaf areas, and lower water-use efficiencies, stomatal conductances, and leaf areas per stem area than perennials. (2) Photosynthetic type largely affected leaf physiology as expected, but interacted with life history in determining specific traits. Leaf hydraulic conductance was intermediate in perennials, highest in C4-annuals, and lowest in C3-annuals. (3) Phylogenetic principal component analysis confirmed that in this subtropical environment life history is the predominant axis separating species, and annuals and perennials were more different within C3 than C4 grasses. This study emphasized the influences from both life history and photosynthetic type on plant hydraulic adaptations based on plant functional traits and climatic niches, such interplay between life history and photosynthetic type may be an overlooked factor in shaping the physiological ecology of grasses. This study has been published in Journal of Experimental Botany (https://doi.org/10.1093/jxb/ery462) . Fig. Classification of grass species, data framework, and summary of best-fit models for interspecific variation in functional traits. (a) Cladogram of the 42 grass species from subtropical China. Bold letters near the branch nodes indicate the subfamilies: Arundinoideae (A); Panicoideae (P); Chloridoideae (C), and Pooideae (Po). Symbols indicate the photosynthetic type (PT: C3, open circles; C4, black circles) and life history (AP: annual, white open triangles; perennial, black triangles). (b) Breakdown of species numbers based on categoriszations of PT and AP. 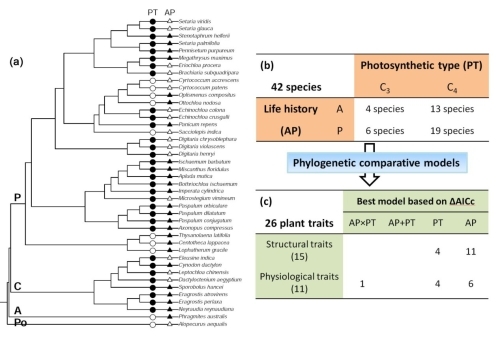 (c) Breakdown of best-fit models for plant functional traits, indicating the modelled factors and the number of traits for which each model provided the strongest fit.